Generally we consume meatballs with a spicy sauce in the form of a starter or an appetizer. 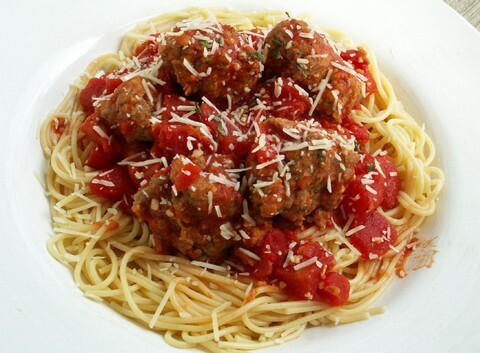 Today's recipe includes regular spaghetti topped with cheesy and spicy meatballs braised in an aromatic sauce. I've used minced goat meat for the meatballs but you can use beef or chicken too. One can also experiment with the fiery sauce used for the meatballs. You can replace some of the spices with the local herbs to get a familiar taste. Although I've kept spaghetti quite simple, you can mix it with the sauce to blend both of them together in a common base. Meatballs leftovers can be added to the gravy and can be served with steamed rice. Let's make this irresistible recipe that's moist, chewy and scrumptious. Enjoy this fulfilling and delicious preparation which includes cheesy meatballs drenched in a spicy and creamy curry you can relish with tasty spaghetti. Wash minced meat thoroughly in a bowl and drain all the water. Boil 1 liter water in a pan and add spaghetti in it. Stir for about 3 minutes and switch off the flame. Wash cherry tomatoes and blend them into a smooth paste. Take a large bowl and add minced goat meat in it. Add chopped onions, green chilies, cilantro, chickpea flour and salt in it. Mix well with your hands till everything is blended within meat. Make meatballs with hands and keep aside. Take a deep frying pan and heat olive oil in it. Add onion paste and stir fry till it turns light pink. Add red curry paste with quarter cup of water. Simmer for about 3 to 4 minutes and add cherry tomato paste. Add black pepper powder, cheese, green chili paste and salt. Mix well with a spoon and simmer for 5 minutes with a covered lid. Carefully add meatballs in the spicy sauce with 1 glass of lukewarm water. Cover the lid and simmer for about 15 minutes. Take a wok and add 2 tbsp oil in it. Add spaghetti and season with salt. Saute for about 2 to 3 minutes on a high flame. Take a large and flat serving plate and make a layer of sautéed spaghetti. Pour fiery sauce on top of it and place meatballs above it.